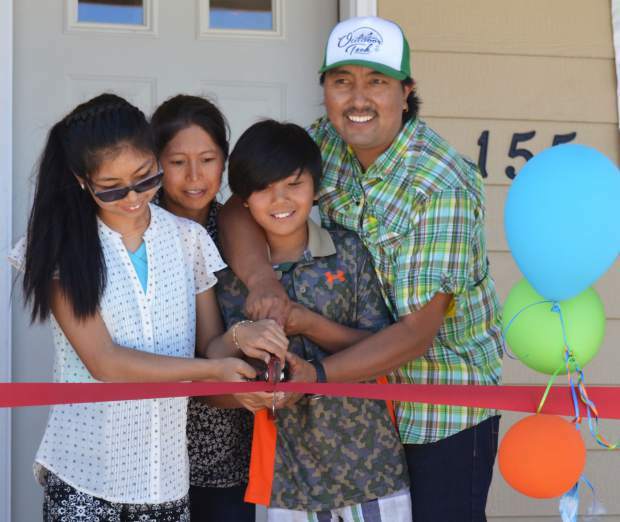 Mingma Sherpa and his family are among seven Habitat for Humanity Vail Valley families who dedicated their new homes Saturday morning in Gypsum. Habitat for Humanity builds simple, decent, affordable homes in partnership with local families in need. They’re accepting applications for partner families. For more information or to donate or volunteer, visit www.habitatvailvalley.org or call 970-748-6718. GYPSUM — Mingma Sherpa was a Himalayan mountain guide and summited Mount Everest six times. He moved his family from Nepal to the Vail Valley. They’re one of this spring’s Habitat for Humanity Vail Valley seven new partner families. Saturday morning, he and his family walked three steps and cut the ribbon to dedicate their new home. For excitement, those three steps and moving his family into their new home stacks up to Everest, he said. “We’ve had lots of different experiences since I was climbing mountains in Nepal. … Lots of changes. This feels good. It’s a great experience,” he said. Hope, is one answer. Futures, is another. Laura Gonzales started her home last May and worked through the winter. John and Amalia Castillo are Habitat homeowners in Fox Hollow in Edwards and came to Saturday’s dedication in Gypsum with four cases of homemade burritos and homemade salsa. Dozens of people gathered to dedicate the seven new homes for the seven partner families. Along with the local and regional volunteers, a dozen or so Americorps volunteers were in attendance. Gabriel Skamla, for example, graduated the University of Pittsburgh with a degree in architecture. He wanted to learn construction. He did. Saturday was executive director John Welaj’s 10th dedication. He still chokes up a little. “It never ceases to amaze me how generous this community is,” Welaj said. Gypsum has been a big Habitat for Humanity supporter, waiving every fee and cost for the homes. Gypsum is also a Playful City USA, which helped it get a $150,000 grant for playground and other things in and around the neighborhood. Habitat Vail Valley’s home dedications asked God to bless the new homes, which many say has already occurred. Members of the Eagle Valley Presbyterian Church presented each new resident with their own quilt, so that along with their warm hearts they’ll also have warm feet. Selection is based on need, ability to pay and willingness to partner with Habitat for Humanity. Family income must be between 38 percent and 80 percent of the area’s average median income. For a family of four, that’s $30,940 to $70,720. You have to complete home ownership classes that cover personal finances and budgeting and each adult in your family must work at least 250 hours constructing your home. Your payments are based on a zero-interest loan and 30 percent of your income.